When creating an inbound strategy, it's important you do a content audit to help you identify what type of content you currently have and what's missing. Here's how to do a content audit for inbound (along with a free downloadable template). Before you and your team start discussing what type of content you want to create for your inbound campaign, you must create a list of all your content. And when I say 'all', I mean everything. Every piece of marketing content your company has created must be collected. It can take a day or even up to a week to collate everything (if you don't have much free time) but it's important to complete this step properly as this will act as a foundation to how well your content audit will be carried out. It's advised you create an Excel sheet where you can log all your pieces of content. 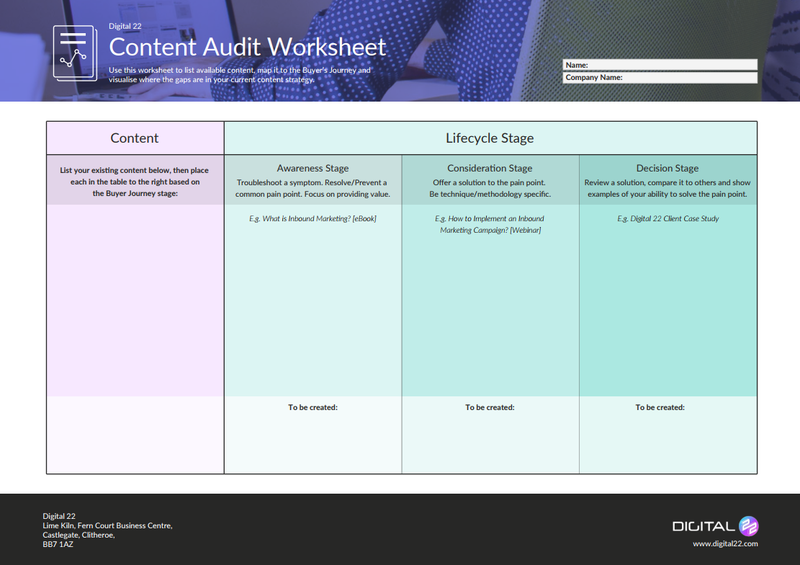 To carry out a successful audit, you will need a content audit worksheet. You can create your own or download our free template. Now you have all your content together and a template to work on, you can starting mapping out your content. It will need to be mapped out into the different life cycle stages (Awareness, Consideration and Decision stages). The 'life cycle stages' refers to the different stages in the buyer's journey. When you're creating an inbound marketing strategy, you need to consider you will be getting potential customers visiting your website at different stages of their own buyer's journey. To ensure your marketing is as effective as it can be, you will need content for each stage. On your content audit worksheet, map out your current content into each stage. All Awareness type content will go in the Awareness stage, all Consideration content will go into the Consideration stage, etc. 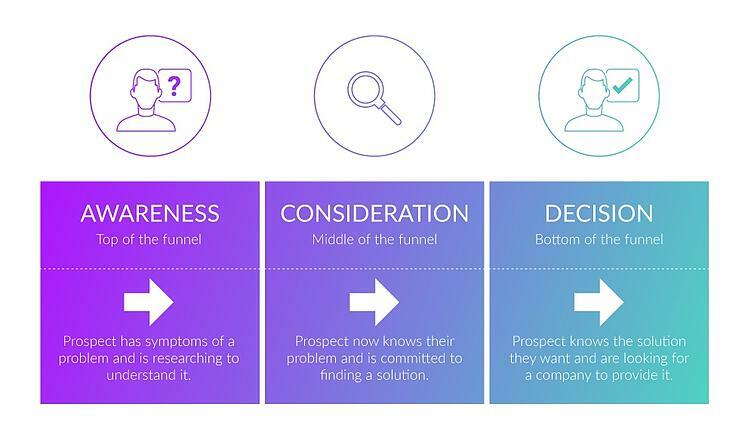 If you need help determining which stage your content should go in, use the buyer's journey as a reference. In the worksheet above, I've listed some different types of content in the left-hand column, then placed them into the different life cycle stages. This helps me clearly see what areas are lacking in content. When you have completed the worksheet, you will be able to identify what areas need more content. A common mistake for many businesses is to have lots of Decision-type content like portfolios, testimonials and case studies, rather than Awareness and Consideration content. Highlight what areas are in need of more content and then prepare for a brainstorming session. After identifying what type of content is missing, you will need to determine what type of content you need to create to fill the blanks in your marketing. You can create a strategy by yourself but it's really worthwhile to get a team together so you can brainstorm ideas. Ask employees who work in sales, customer service and other areas of the company to join in on the brainstorming session. This way you can get a better understanding of what type of content your ideal buyer persona is looking for. If your content audit has revealed your inbound strategy is lacking Awareness content in particular, then your customer service team could provide content ideas based on the questions they've heard from customers. Your sales team could suggest ideas for eBooks and guides, based on topics they believe would be helpful to potential customers. To create a successful inbound strategy you have to provide content that is helpful and relevant to your ideal buyer persona. Offer content that people are searching for and will benefit them. To get the best out of your content audit, it's important to do every step described above. Some businesses rush through their content audits because they don't think it's that important but in actual fact, your audit will help determine what direction your content production will take. When it comes to inbound marketing, you have to carefully consider what type of content your ideal buyer persona is looking for and ensure you offer better value than your competitors. As an inbound marketing agency, we do content audits for all of our clients. We map out their current content to identify which areas need improvement and then decide what content will attract their ideal customer and guide them along the buyer's journey. 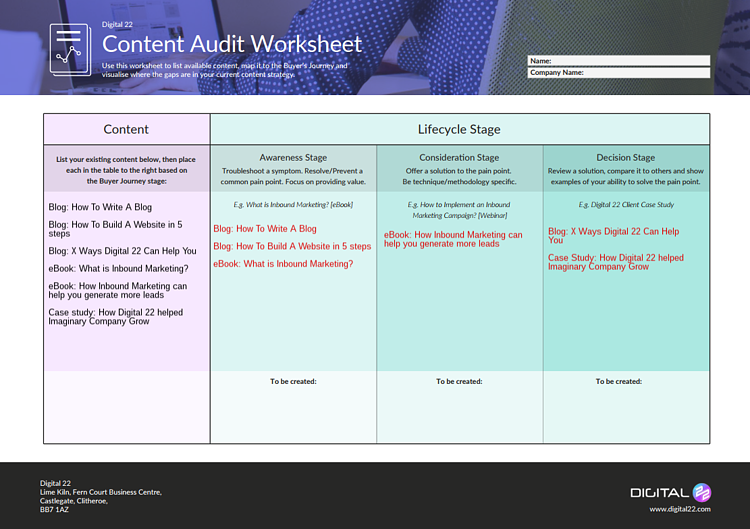 Ready to start your own content audit? Our free inbound starter pack has a content audit worksheet and other templates you need (like buyer persona template, email workflow worksheets, etc) when creating an inbound marketing strategy. Download your free pack.